Standard springs for all Koford motors. Spring material withstands 800°F. Conductive springs for non shunted C can motors. Silver plated high strength copper alloy. Reduces resistance between buss bars and brush for more power. 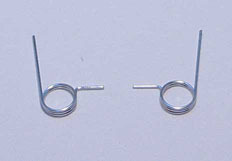 Use with M608 brass spring cups for lowest resistance. The famous multi-coil springs, which Horky use in his motors. REGULAR configuration, at my opinion, the best choise for ES-32 & ES-24 motors. Correspondingly, with the help of duck-bills, the angle of the springs can be changed for each motor individually. LIGHT configuration, at my opinion, the best choise for X-12, 16D & F1/32 motors. Correspondingly, with the help of duck-bills, the angle of the springs can be changed for each motor individually.